1. Preheat the grill to high. Score the aubergine slices with a sharp knife then spread them over a large non-stick baking tray. Grill on each side for about 7 minutes until golden. Spread with the miso sauce and grill for 2 minutes or until sticky and glazed. 2. Meanwhile, toss the cucumber with vinegar, sugar and ginger and season to taste. 3. 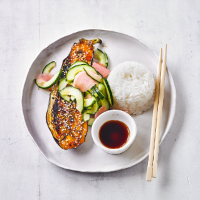 When the aubergines are ready, scatter with the sesame seeds and grill for about 1 minute more, until the seeds are golden. Serve with the salad and the rice, seasoned with a splash of soy. Cook’s tip Bring a platter of sushi to the table to serve alongside this recipe instead of plain rice.